Go to My Site → Settings and select the Export tab to download a .xml file of your blog’s content. 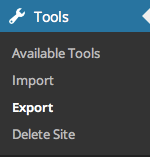 Go to Tools → Export in your WP Admin dashboard to download a .xml file of your blog’s content. If you get multiple XML files, just select them all for uploading (using CTRL key). Export everything in order to get your embedded galleries rendered!